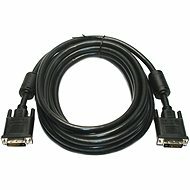 DVI cable with a length of 10m, for digital connection of LCD panels to a computer. The DVI-D standard transmits only a digital signal, so it can connect the digital output on the graphics card and the digital LCD display. 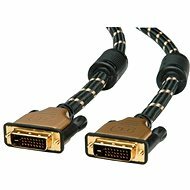 Cannot be combined with DVI <-> VGA reductions. 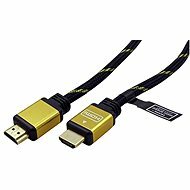 The cable is a dual link, capable of working at 1,920 x 1,080 pixel resolution (HDTV 1080p standard) or up to 2,560 x 1,600 pixels. For shipping to other EU countries visit this page ROLINE interface DVI-D for LCD, 10m. 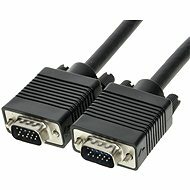 Für Versand nach Deutschland, besuchen Sie bitte ROLINE DVI-Kabel Dual Link DVI-D M 10 m - Schwarz. Chcete doručit zboží do Česka? Prohlédněte si ROLINE propojovací DVI-D pro LCD, 10m. Chcete doručiť tovar na Slovensko? Prezrite si ROLINE prepojovací DVI-D pre LCD, 10 m. Für Versand nach Österreich, besuchen Sie bitte ROLINE DVI-Kabel Dual Link DVI-D M 10 m - Schwarz. Magyarországra történő kiszállításért tekintse meg ezt a termékoldalt: ROLINE DVI-D interfész LCD, 10m.